The Dahle Premium Trimmer is a heavy use trimmer designed for studio and business use. From an individual sheet, to 22 sheets, or a mat board, this trimmer is a reliable tool that will serve you well for many years. The high capacity trimmer features a self-sharpening blade that will always assure you of a neat, straight and precise cut. The square guide rod holds the paper in proper alignment which the auto clamp keeps it firmly grasped. The cutting surface is marked in inch and metric markings and is supported by a rugged metal base. For added convenience, the adjustable backstop fits on either side of the trimmer. 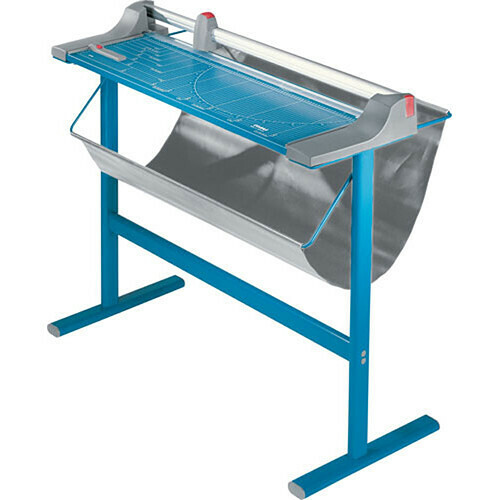 This 446 Dahle Premium Trimmer is a heavy use trimmer with a 36.25" cutting length designed for studio and business use. From an individual sheet to mat board, this trimmer is a reliable tool that will serve you well for many years. The high capacity trimmer features a self-sharpening blade that helps ensure a neat, straight and precise cut. The square guide rod holds the paper in proper alignment while the auto clamp keeps it firmly grasped. The cutting surface is marked in imperial and metric markings and is supported by a rugged metal base. For added convenience, the adjustable backstop fits on either side of the trimmer. This Dahle Metal Stand for the 446 Premium Rolling Trimmer, which can be supplied as an accessory, makes trimming easier by providing the correct working height. Box Dimensions (LxWxH) 45.7 x 19.5 x 8.2"
Box Dimensions (LxWxH) 39.0 x 8.0 x 5.0"